Smart phones have been tremendously popular in the recent years. There is little surprise in the continuously increasing demand of smart phones all over the world. Gone are the days of the rudimentary mobile phones which provided the most basic of facilities (like calling and messaging). With the boom in the communication technology, we frequently see a new mobile phone getting launched in the market which claims to be better than its predecessor. Needless to say, the battery consumption of the smart phones is very high. Unlike the good old mobile phones which when charged once would function for 3-4 days easily, smart phones usually do not provide such a performance as far as the battery backup is concerned. And it is justified as well. There are a plenty of operations and functions which continuously run in the background even when you are not using your smart phone. So invariably the issue of battery backup pops up while selecting a smart phone. As the performance of the phone’s battery is a very important issue, operating systems like Android and iOS furnish the battery usage broken down according to various apps installed on the phone which could be utilised by the user to be aware of the power-consumption related behaviour of the apps. 1. Check the apps which consume the most power: To start with, it is always better to have a look at the apps which consume the maximum power. This can be easily checked in operating systems like Android and iOS. Checking the status of the battery consumption gives you a very good idea about where you have to start with to increase the battery backup. In fact, there might be some apps which you didn’t know were active and consuming power. Once you have a look at the battery consumption of the various apps, it is for you to decide which apps you want to close. 2. Manage the brightness: Make sure that the “Auto Adjust Brightness” feature of your smart phone is off. Its better that you manually adjust the brightness of the screen to the minimum level that is comfortable to you. You can also use dark backgrounds for apps to minimise battery consumption. High brightness not just consumes more battery, but also it affects the eyes on continuous use of the phone for long hours. 3. Auto syncing hogs power: There are many apps (like Facebook, Twitter or some news apps) which constantly sync themselves automatically. This auto-syncing consumes a lot of battery power. The interval of syncing can be increased so that it does not hog power continuously. 4. Turn off all the additional features when not in use: Additional features like WiFi, Bluetooth, GPS consume a lot of power when kept switched on continuously. So it is advised that these features should be switched on only when required and switched off immediately after use. 5. Mind the temperature: People tend to ignore this very important aspect of mobile phones, or any electrical appliance for that matter. Avoid keeping your phone in direct sunlight, or near a heat-emitting appliance (like room heater) as excess heat affects the efficiency and in turn reduces the battery backup. 6. Avoid using live wallpapers: As fascinating as live wallpapers appear to the eyes, they are big battery guzzlers. The animation in those wallpapers consume battery continuously. 7. Avoid using many apps at the same time: Smart phones manufacturers keep coming up with faster and higher end models which are better than their predecessor in terms of handling many apps at the same time. While with the advent of new technologies in smart phone processors, it is possible to manage many apps at the same time without affecting the overall speed of the phone, but one should bear this in mind that running too many apps simultaneously affects the battery performance of the phone. 8. Do not overcharge: Some people have the tendency of plugging in their smart phone for charging and leave it overnight. This impacts the battery negatively. Also sometimes the phone gets heated up which also is not good for the battery. 9. Use the “energy-saver” feature: Phones usually have an in-built “energy-saver” feature which can be activated or deactivated by the user. Once this feature is activated, it makes sure that only the apps and processes which are absolutely necessary are running thereby reducing the excess load on the battery of the smart phone battery. 10. Signal strength of the network: When a phone has a poor network strength, it constantly hogs power to keep up the network signal. It means that if your phone is in a region where the signal strength of the network provider you are using is not good, then the battery of your phone would be drained quickly. 11. Use a conservative limit for the time-out of the screen: Have you ever paid attention to how many times you wake your phone up? In fact, many a time it happens that people just light up the screen without any apparent reason! So it might be a good idea to reduce the screen time-out to the lowest limit admissible to you. 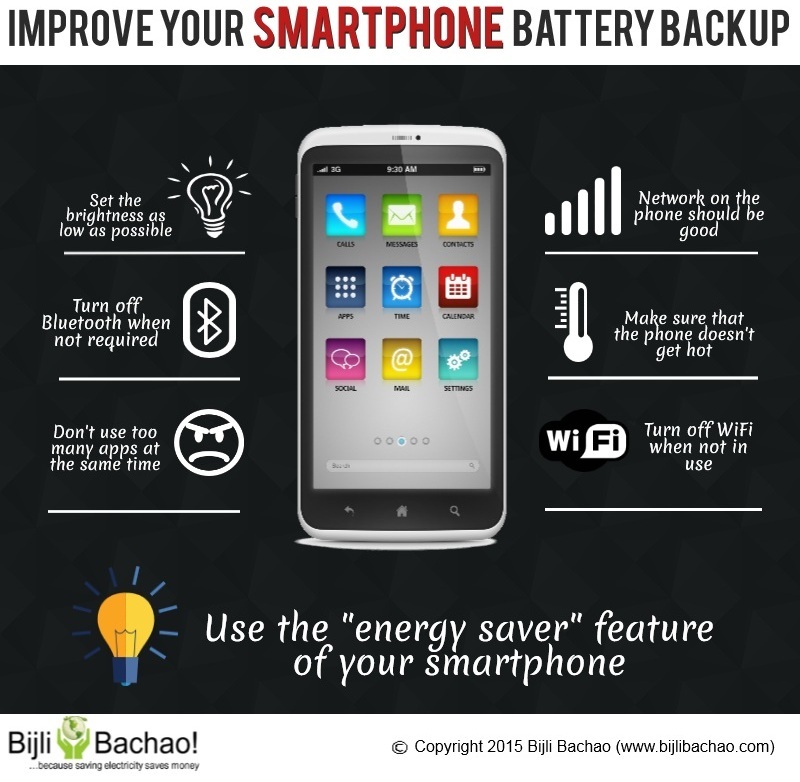 The battery backup of smart phones has been a ground of a lot of deliberation and research for the smart phone manufacturers. It is true that the best possible amount of battery backup comes at the cost of the ease and comfort of the usage experience of the customers. But following these simple tips can not only provide you with a decent usage experience, but also significantly improve the battery performance of your smart phone.